What can you do at home to help protect Garry oaks? In Canada, unique Garry oak meadows and woodlands form the natural habitat of southeastern Vancouver Island. They are one of the most endangered Canadian ecosystems. These plant communities are part of our natural and cultural heritage and we all have a responsibility to pass them on to the next generation. Get started by consulting with our FAQ page and our page on local Tree Protection Bylaws! You can also help protect and restore the oak meadows by following some of the suggestions below. 1. Convert your garden into a Garry oak meadow. While it is not possible to duplicate a natural meadow, which has native grasses and rare species for which it is difficult to obtain seed, you can restore the natural habitat by planting Garry oaks, associated shrubs and wildflowers. Several local nurseries specialize in native plants; others may stock or order them if you let them know there is a demand. GOMPS has a list of where to obtain plants and seeds locally. 2. Collect Garry oak acorns and grow your own trees. In the urban areas in particular, regeneration of Garry oaks is a concern; many people do not allow sprouted acorns to grow and very few seedlings survive to maturity. Collect acorns from local trees in the fall. The more you collect the better chance a seedling will survive. Be prepared for some successes and some failures. Many of the acorns contain weevils so try to select acorns without holes. Poke the acorn on its side into your garden soil and cover with a handful of leaves. When the seedling appears, surround it with wire mesh to protect it from scavenging rodents. Water through the first two summers, fertilize, and keep grass cleared off in a 1 m circle around the seedling. 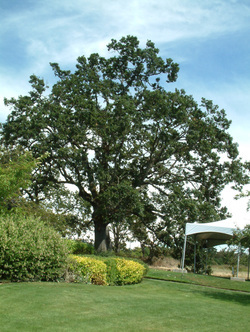 Garry oaks are slow to grow; most of the initial growth occurs underground. 3. Let nature do all the work! Fend off lawnmowers, sprinklers, animals and chemicals. As a rule of thumb, to guarantee the survival of your native plants, allow the most natural conditions to prevail. After all, they have been surviving here for nearly 8,000 years. Leave the leaves. If raking leaves is not your idea of Saturday morning exercises, leave the leaves for nurturing the soil underneath. Or if you must, rake them up in the fall, as they make wonderful garden compost. If a Garry oak seedling happens to spring up in your lawn, consider protecting it with a sleeve made from a sturdy material. 4. "There's no room for broom!" Resist the temptation to grow exotic species around your Garry oaks. An introduced smothering plant, like English ivy, kills trees by shading the leaves and producing a "sail" effect causing trees to blow down in winter storms. Scotch broom, Himalayan blackberry, gorse and Daphne are also introduced plants and block out native wildflowers. Pull these species out from late October to the end of January by the roots, if you can. In the growing season, cut below the first lateral root if possible. The natural understory of shrubs and wildflowers will grow if given space. Remember, "There's no room for broom, and gorse is worse" and "At Christmas, make merry and prune your blackberry." You can also participate in community "Broom Bashes". 5. Protect trees from stress. Attach signs, clotheslines, and Christmas lights to your house and fence, not to your tree. There are enough stresses and strains on it without adding a few more. Garry oaks are shade intolerant and it may be necessary to remove other trees shading out the oaks for their survival. 6. Construction can be fatal. If you must do any digging, trenching or construction near an oak, remember the most vulnerable parts of the tree are the roots within the first three feet of soil. Protect the root zone when paving by laying down a thick layer of crushed rock with occasional vertical drain tile vents to the surface for aeration and water after paving. Though an oak develops a deep taproot early in life, later on the most important roots are shallow ones. Mature trees tolerate change less and less (like we). It might take 10 years to kill an oak tree after construction smothers its roots. 7. Protect trees in your community. Take action when you think Garry oaks may be damaged or cut down. Talk to your neighbours, the municipal parks departments, builders and developers about growing and caring for Garry oaks and native plants. Garry oaks are protected trees in some but not all municipalities. Persuade local politicians to enact a tree-preservation bylaw. 8. Remember that Garry oaks are only one species in Garry oak ecosystems. All levels of government need to be lobbied for more protection for this endangered ecosystem. For example, municipalities need to use the stewardship tools given them in the Municipal Act. Unless the public demands that they do so, local governments are reluctant to pass bylaws protecting habitat. 9. Support your local land trusts which are buying endangered Garry oak habitat to ensure its protection forever.